The front terrace will give you the perfect place to enjoy your breakfast watching the sun rise should you be up early enough. The main entrance leads into the lounge where you will find a dining area and sofa with free wi-fi, English TV, CD/DVD Player and air conditioning. Should the weather not be good or you just want to chill this is the perfect place to do it. 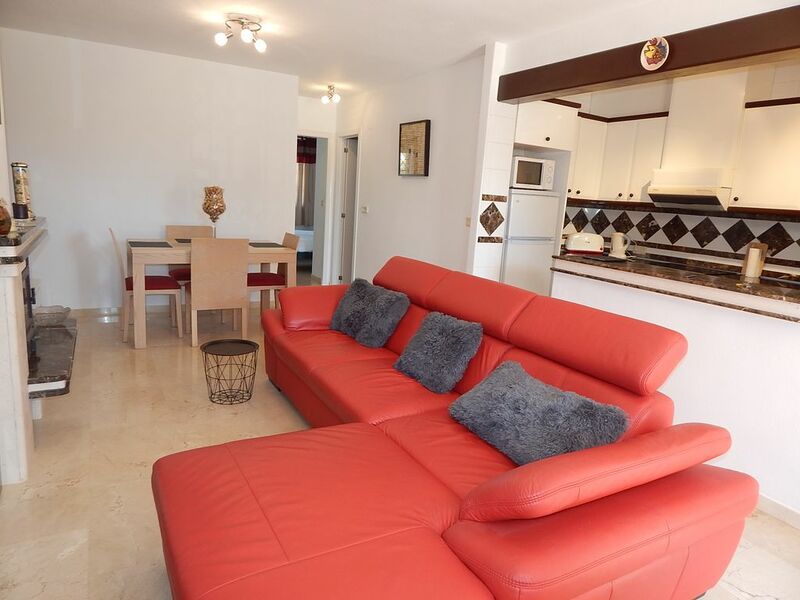 The kitchen is open plan and is equipped with oven/hob, Microwave, and a fitted kitchen, you will find all of the utensils you need should you wish to dine in on your holiday. The master bedroom has a double bed, air conditioning and a fitted wardrobes. The second bedroom has 2 single beds and fitted wardrobes. and air conditioning. The property has a family bathroom. You will also find a BBQ at this property should you want to enjoy a night in. A €15 surcharge applies for departures and arrivals 8.00pm - 10.00pm, €25 if later. Departures prior to 8.00am will be charged €15. Thank you so much for taking the time to write a review, we are so glad you enjoyed your holiday and hope to see you at a Gleam Team Rental property again in the future. Thank you so much for giving our property a 5 star review, we are so glad you enjoyed your stay and look forward to seeing you at a Gleam Team Rentals property again in the future. Everything about this property is perfect.Very clean and comfortable place,well equipped and close to shops , restaurants and near the sea. Definitely will recommend and return back. Thank you Sharon. Thank you for taking the time to write a review on our property, we are so glad you enjoyed your stay and look forward to seeing you again in the future. Thank you for taking the time to write a review, we are so glad you enjoyed your holiday and look forward to seeing you again in the future. Nice safe area. Comfortable beds, modern amenities, great bathroom shower. Shower floor can become very slippery so would be good to advise holiday makers to use a bath mat. Did miss having a dishwasher but that's a minor issue. Thank you so much for taking the time to write a review, we are so glad you enjoyed your holiday and will ensure bath mats are supplied to guests in the future.